Modern ensuite and studio student rooms available at Sheffield 3 in Shalesmoor in the heart of Sheffield. Close to The University of Sheffield and Sheffield city centre. Sheffield 3 is a modern and stylish student accommodation complex, located in the heart of the popular student area of Shalesmoor. Located just a short walk from the heart of the city, Sheffield 3 is in a great location for students. The University of Sheffield is just 10 minutes' walk away, and there are supermarkets, bars and restaurants, sports facilities and a doctor’s surgery all within easy reach. Sheffield International College and the English Language College is right next door too. Meadowhall Shopping Centre in Sheffield is less than 40 minutes away on public transport. If you chose to live in our shared, cluster accommodation, we will provide a monthly kitchen and living area clean. 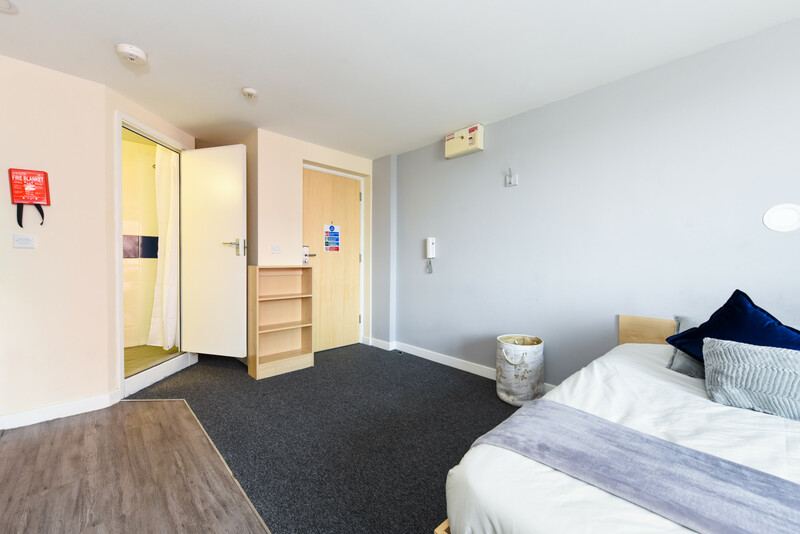 The ensuite rooms are perfect for large groups of students looking to make the most of their time at university. Students benefit from free high speed 100Mbps WiFi, all utility bills included, flexible payment terms, free contents insurance and 24 hour security. Create your ideal tenancy. Stay from 44 to 58 weeks. Secure your room with just a £250 deposit, with no further payments until after the 1st October 2019. Short stays are also available. If you'd like to share with a friend or live as a couple, dual occupancy is now available at no extra cost in our studio rooms.